New reviews, interviews, and features via RSS or Email. 95 min. Sony Pictures Releasing. Director: Wes Anderson. Cast: Luke Wilson, Robert Musgrave, Owen Wilson, Lumi Cavazos, James Caan. In the last twelve years, Hollywood has gotten plenty of mileage out of Owen and Luke Wilson, two talented Texan brothers. And fans of the auteur theory have been geeking out just as long for Wes Anderson, who has thrice co-written scripts with Owen. But the film that started it all, Bottle Rocket, remains a cult film. It's the sort of film that sends a select few (including super-fan Martin Scorsese) into paroxysms of acclaim while driving many more batty with its eccentric humor and a mischevious story that simply refuses to behave. And so it will remain: though flawed, Bottle Rocket is full of buried treasures and holds up to repeated viewings, as any cult film should. Expanded from the Sundance-selected short film of the same name, Bottle Rocket comes directly from the minds of co-writers Anderson and Owen Wilson (back in the day, when he was "Owen C. Wilson"). The debut feature established many elements of Anderson's idiosyncratic (some would say "precious") style, notably his patient pacing and distinctive use of the frame: establishing symmetrical, right angle compositions and then undermining the symmetry. In addition to the essential Wilsons (including a third brother, Andrew, as a character dubbed "Future Man"), Bottle Rocket for the first time pairs Anderson with the inimitable Kumar Pallana (who shares with Owen Wilson a deadpan rapport made in heaven). There's also a soundtrack by Mark Mothersbaugh and memorable use of source music, like the Rolling Stones' "2000 Man." Owen Wilson grabs the bull by the horns as an indelible screen loser named Dignan. With the enthusiasm of a grade-schooler, Dignan starts a criminal gang by insistently prodding his only two friends: Anthony (Luke Wilson) and the ironically named Bob Mapplethorpe (Robert Musgrave). Dignan's not-so-nefarious criminal mind conjures up crimes about as brilliant as Ralph Kramden's get-rich-quick schemes, beginning with the klutzy armed robbery of a bookstore. Heading out "on the lam," the team winds up hiding out at a motel only Anderson could love: two long, symmetrical rows stacked one on the other and dotted with bright-red doors. It is here that the film meanders, turning laziness into an offbeat narrative virtue. It seems entirely likely that not a soul is looking for these "outlaws," though dreamer Dignan behaves as if he's Charles Starkweather, or some other "wanted" man against the world. Dignan's tragedy is the inward suspicion that he's not wanted, a feeling exacerbated when best friend Anthony's attentions turn exclusively to the motel's pretty, Spanish-speaking maid Inez (Lumi Cavazos). Their comical courtship, played in perfect poker face, barely succeeds on its own as a subplot: the writers prove too willing to turn it on a dime. Still, the threat of romance to disrupt the film's central bromance proves just the thing to keep narrative tension stirring between criminal enterprises. After much talk about a supposed criminal mastermind named Mr. Henry, the boys finally set off in search of him. he turns out to be James Caan in a topknot, effortlessly intimidating in a manner that suggests he's very much playing himself (the topknot is a signifier of Henry/Caan's devotion to karate). At this point, the film once more picks up steam as it builds to the most ridiculous heist in the history of cinema, a deliriously disastrous raid on a cold-storage facility. Needless to say, little goes according to Dignan's naively hubristic "75-Year Plan," though it seems likely the Wilsons and Anderson are well on their way to achieving it and then some. 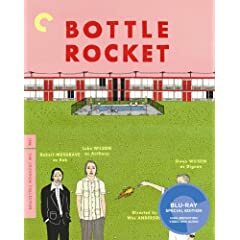 One of the Criterion Collection's first Blu-ray debuts (released concurrently on DVD), Bottle Rocket becomes the fourth Wes Anderson film to get the deluxe Criterion treatment. Spine #450 comes to Blu-ray with nifty menus, as well as a "Timeline" listing chapters of the film and touchstones in the commentary. The hi-def image quality is second-to-none and on Blu-ray handily bests any other home-video presentation of the film. As supervised and approved by director Anderson and DP Robert Yeoman, the beautifully film-like image is rock-solid, vital in color and detail, and free of any blemishes or digital artifacts (as usual, Criterion also includes color bars for your convenience in ensuring your set is properly calibrated). Just as the MTI Digital Restoration System and Pixel Farm's PFClean dust off the image, audio restoration tools reduce unwanted noise on the DTS-HD Master Audio 5.1 soundtrack (not stereo, as listed on the packaging), which does full justice to the snappy dialogue, rich music selections and ambient effects. Criterion is, of course, renowned for its scholarly, thorough and entertaining bonus features. Anderson and co-writer/star Owen Wilson anchor a wonderful, brand-new commentary that's a trip down memory lane for the talented old friends. They recall the process of turning the short film into a feature while discussing the many interesting personalities involved, all of whom can be found in a making-of doc. They also reflect on the film's disasterous test screening, and point out the subsequent reshoots. More than anything, it's a chance to be a fly on the wall for a surprisingly loose and relaxed chat between Anderson and Wilson. "The Making of Bottle Rocket" (25:43, HD), directed by Barry Braverman (an associate of Anderson and Wilson), features interviews with Anderson, executive producers James L. Brooks and Richard Sakai, James Caan, Temple Nash Jr., Kumar Pallana, producer Polly Platt, composer Mark Mothersbaugh, Robert Musgrave, set decorator and production designer David and Sandy Wasco, cinematographer Robert Yeoman, and Andrew, Luke and Owen Wilson. Rare footage includes Pallana's videotaped audition and a deleted clip of Pallana spinning plates, but the most memorable portions of the doc include the various talents looking back in laughter at the craziness of the pre-production (lots of talk about how the boys regarded their per diems) and the humorously contentious creative discussions between the producers and the director. The 1993 short film "Bottle Rocket" (13:35, HD) offers a chance to enjoy the brilliant black-and-white short that started it all by garnering attention at the Sundance Film Festival. Its Woody Allen-esque jazz score perfectly complements the Wilsons' jazzy rhythms as they riff on Starsky and Hutch and practice their robbery skills. Robert Musgrave also creates the role he would reprise in the feature. Next up are eleven priceless Deleted Scenes: "Sc. 8 Car Wash" (:58), "Sc. 9: Eating Sandwiches" (1:09), "Sc. 11: Goff's Hamburgers" (1:13), "Sc. 16: Driving Scene" (:53), "Sc. 19: Temple Nash Jr" (2:32), "Sc. 27-29: Police in Bob's Backyard" (2:44), "Sc. 30: On the Lam" (1:12), "Sc. 33-35: Commander Dignan" (2:45), "Sc. 48-49: Bad News" (1:33), "Sc. 58-59: At the Motel" (2:06), and "Sc. 88: Dignan and Applejack" (1:29). We also get a preproduction Anamorphic Test scene (2:33) shot in the Panavision format, some lovely pre-production and production Photos by Laura Wilson (mother of the Wilson boys), and Anderson's original Storyboards. "The Shafrazi Lectures, No. 1: Bottle Rocket" (10:32, HD), shot at the Tony Shafrazi Gallery in New York City, inaugurates what looks to be a new series in Criterion extras. Artist Tony Shafrazi enthuses about Bottle Rocket while turning it into a new piece of gallery art by projecting the image onto walls and poster boards, bending the light to his whims and creating new framing to highlight what he sees in each image. It's an interesting experiment in creating new found art out of old movies. Last up is Braverman's 1978 short film "Murita Cycles" (27:12, HD), a likeable, personal film about Braverman's father Murray. Murray Braverman ran a Staten Island bicycle shop, and his son's portrait collects opinions on the father and allows Murray to share his personal philosophy. As Criterion notes, the film was also "an inspiration for the filmmakers during the production of the Bottle Rocket short film." As per Criterion's high standards, the packaging adds value to the set, starting with cover art and menus by Ian Dingman, who also illustrated previous Anderson releases. The 24-page booklet begins by reproducing Dignan's hilarious "75-Year Plan," and also includes essays by Martin Scorsese (reprinted from Esquire) and James L. Brooks (from the published Rushmore screenplay). 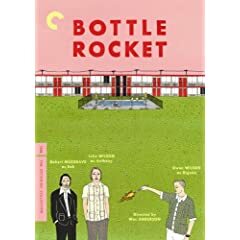 Bottle Rocket: The Criterion Collection comes highly recommended, especially in a "nice price" Blu-ray that can be had for little more than the DVD. All site content © 2000-2019 Peter Canavese. Page generated at 04/20/2019 08:46:36AM.